Combining clean design, small size and low cost. With the housing molded from mineral and glass filled nylon and the lens molded from polycarbonate, the gage will withstand rough use and exposure as well as high total pressure. The 5% accuracy and low cost of the Minihelic II gage make it well-suited for a wide variety of OEM and user applications. OEM applications include cabinet air purging, medical respiratory therapy equipment, air samplers, laminar flow hoods, and electronic air cooling systems. As an air filter gage, the Minihelic II finds many end use applications on large stationary engines, compressors, ventilators, and air handling units. Minihelic II gage is suitable for many of the same applications as the Magnehelic gage where the greater accuracy, sensitivity and higher and lower differential pressure ranges of the Magnehelic gage are not required. Housing: Glass filled nylon; polycarbonate lens. Accuracy: ±5% of full scale at 70°F (21.1°C). Pressure Limits: 30 psig (2.067 bar) continuous to either pressure connection. Size: 2-1/16" (52.39 mm) diameter dial face. Process Connections: Barbed, for 3/16" I.D. tubing (standard); 1/8" male NPT (optional). A: (Left) The standard Minihelic II gage is supplied with two barbed pressure taps molded into the rear housing of the gage. These connections allow easy, fast connection to the gage using 3/16" I.D. rubber or plastic tubing. B: (Right) For applications in systems having higher total operating pressures optional male 1/8" NPT pressure connections can be supplied. Note the oblong over-pressure vent hole on the back of the gage at the right of connections. This vent is sealed by a membrane molded in conjunction with the diaphragm and will blow out at approximately 75 PSI. Housing is molded from strong mineral and glass filled nylon. Full view lens is removable and molded of tough polycarbonate. Aluminum scale litho-printed black on white, enhances readability. Red tipped aluminum pointer, rigidly mounted to helix is easy to see. Wishbone assembly provides mounting for helix, helix bearings, and pointer shaft. Jewel bearings provide virtually friction-free helix motion. Helix is free to rotate in jewel bearings. It aligns with magnetic field of magnet to transmit pressure indications to pointer. Zero adjustment screw, located behind the removable lens, eliminates tampering. Range spring calibration clamp fixes live length of spring for proper gage calibration and is factory set and sealed. Silicone rubber diaphragm allows accurate response to a broad range of temperatures and at extremely low pressure. Incorporates blow out area for overpressure protection. Diaphragm support plates of lightweight aluminum on each side of the diaphragm minimize position or attitude sensitivity and help define pressure area. 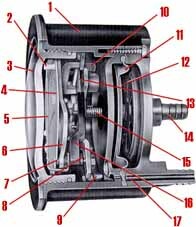 Flat leaf range spring reacts to pressure on the diaphragm. Live length is adjustable for calibration. Small amplitude of motion minimizes inaccuracies and assures long life. Low pressure tap connects to rear chamber. 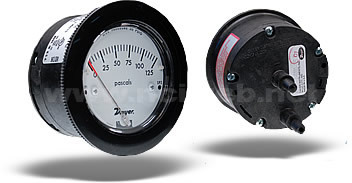 Mounting hardware is supplied with the Minihelic II gage for panel mounting through a single hole, 2 5/8" in diameter. Panel thickness up to 1/2" can be accommodated with the hardware supplied. If necessary, surface mounting of the gage can be accomplished by means of two 4-40 screws into the tapped mounting bracket stud holes in the rear of the gage. Surface mounting requires clearance holes in the panel for the two pressure taps. Model Number Range, PSI Minor Div. Model Number Range, MM of Water Minor Div. Model Number Range, Pascals Minor Div. Model Number Range, kPa Minor Div. *This range employs spirally wound beryllium copper bound bourdon tube pointer drive mechanism. NOTE: Consult factory regarding availability of additional ranges.